Selected raw cacao beans are first washed and disinfected. The skins of the cacao are softened, using low heat treatment at temperatures below 45ºC (110ºF) to preserve the delicate nutrients and flavor of raw cacao, and then the beans are ground and peeled to obtain cacao raw nibs. 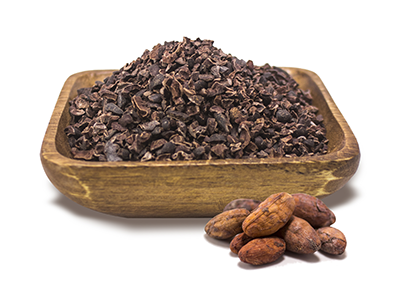 Cacao raw nibs are a rich source of antioxidants, vitamins, minerals and fiber. Industrial use. Human consumption. Sprinkle cacao raw nibs onto yogurt, add to dessert recipes, mix into trail mix, or blend into smoothies to create delicious chocolate treats. Higher content of antioxidants such as polyphenols and flavanols than roasted nibs which may contribute to heart health. High in magnesium and dietary fiber which may contribute to overall good digestive health.